Artificial intelligence (AI) is one of the most publicly-discussed fields of computing. 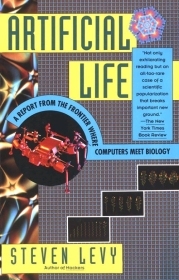 Artificial life (A-Life), on the other hand, is a field of computing much less known to the general public, even though it has some very interesting aspects. For example, while very few philosophers will claim that any glimpse of true intelligence exists in any program written so far, there are quite a few biologists that refer to already-existing programs as “life forms”. Steven Levy’s book on artificial life provides a nice introduction to the field. It begins with a review of the field’s history, from the early suggestions made by John von Neumann and John Conway’s “Game of Life” all the way to current efforts. A-life researches, as well as many biologists, believe that bottom-up complexity has a very large role in many mechanisms of natural life. For example, by using a very simple and minimalistic set of rules to guide simulated birds (“boids”) in a simulated universe, researcher Craig Reynolds was able to re-create bird flocking patterns that appear in nature. Every bird had information only about itself and the birds immediately near it, and no information about the rest of the flock; yet the resulting “emergent behavior” was that of a harmonized flock. In a similar manner, Chris Langton was able to re-create some ant behavior in his “vants” (virtual ants). Without having a “manager” ant handing out task lists every mornings, ants -- both in nature and in Langton’s simulation -- are able to run a “community”. And while many A-Life “experiments” are attempts to re-create aspects of nature, other experiments have proved to be useful tools for proving theories in biology. For example, experiments by David Ackley provide suggestive evidence (but naturally no “proof”) for the Baldwin Effect theory in evolution. Mitchel Resnick’s own epiphany occurred at a children’s LEGO-Logo workshop on constructing creatures. One project entailed writing a program to enable a creature to follow a line drawn on the ground. “We wrote the program and it was following this line,” recalls Resnick. “And all of a sudden it struck me that I had no idea what was going to happen when it reached the end of the line. We'd written the program, but we didn't take that into account. I didn't have time to think about what it might do, so I just watched it. When it got to the end of the line, it turned around and started following the line in the other direction! If we had planned for it to do something, that would have been the ideal thing for it to do. You'll never think about your Lego MindStorm creatures in the same way again. While Levy describes many such computer experiments, readers that happen to be programmers (and I suspect they form a large portion of Levy’s readership) will find that the book whets their appetite, without satisfying it: the program descriptions provide enough details to understand what the program does, but never enough details to recreate it -- which is a great miss, I believe. In one place, though, this lack of information is a good thing. No discussion of artificial life would be complete without mentioning computer viruses, and the last chapter does just that. It begins by describing A. K. Dewdney’s “Core Wars” and MARS system, where programmers wrote programs that fought each other in virtual arenas, and leads to the current reality of computer viruses, some of which, the author suspects, will never be extinct until the platform for which they are written (DOS, in most cases) is completely forgotten. During the last chapter, Levy also discusses the suggestion of several researchers, that predict A-Life creatures will eventually inherit the earth, replacing us humans as the next step in evolution. While the discussion is academically interesting, Levy sometimes drifts into sensationalism, which is a pity.